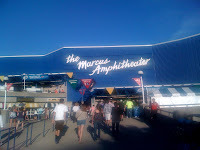 In just 20 days from now, Summerfest 2012 will begin and Rascal Flatts will headline the Marcus Amphitheater as the first of 11 headliners. Rascal Flatts Summerfest tickets are still available for what promises to be a great night of country music. If you go to the show, expect cool special effects as Rascal Flatts is known for incorporating pyrotechnics, lasers, and video into their live shows. Rascal Flatts is no stranger to the tour circuit as the band has been touring since 2000. In fact, in 2006, Rascal Flatts was the most successful group on the road. They just released their 8th studio album in April of this year with their 7 previous albums going platinum. If you're a country music fan, you will not want to miss Rascal Flatts at the Marcus Amphitheater!